Complete the Preschool or Elementary Contract available online (link below). Or you may pick up the forms on February 26, 2019, after the 10:00 a.m. group tour. Return the form on February 28, 2019, at 6:00 p.m. for the early enrollment registration with your enrollment fee of $250.00. Testing may be required for admission before enrolling for Kindergarten or First Grade if the student does not meet the September 1st birth date requirement. Now enrolling! Call Wesleyan Academe Office 972-252-4733 or send us an email. Before/After child care is from 7:00 am to 6:00 pm, $10.00 a day or $160.00 max per month. 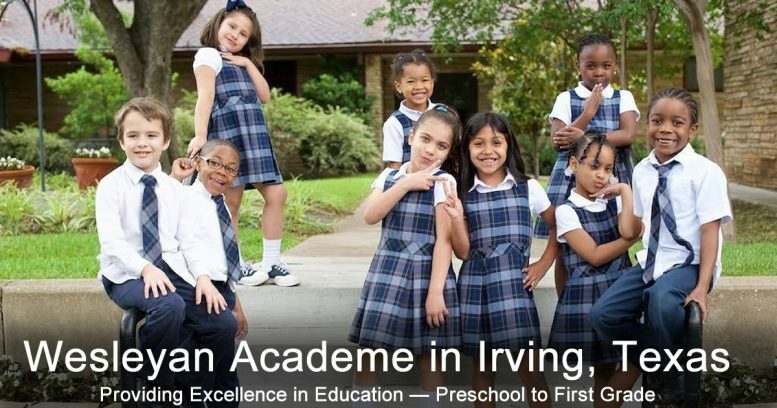 Please see our Pre-Kindergarten Program page for more information about the classes. $4,750.00 yearly tuition or $475.00 monthly tuition on a 10-month contract (August-May). Class is from 8:30 am to 3:15 pm. Before/After child care is from 7:00 am to 6:00 pm, $10.00 day or $160.00 max per month. Please see our Kindergarten Program and First Grade Program for more information about the classes.